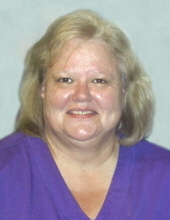 Sherrie L. Spore, 65, of Waterloo, died Tuesday, April 2 at the Cedar Valley Hospice Home from cancer. She was born Dec. 22, 1953 in Waterloo, daughter of LeRoy H. and Thelma Richmond Naber. She married Daniel D. Spore on May 17, 1980 in Evansdale. Sherrie graduated in 1972 from Waterloo East High School. She was a mother and a homemaker. She also worked for MET Para Transit until 2004. She is survived by her husband; two daughters, Faith (Bill) Bronson and Breanna (Chuck) Reiss all of Waterloo; four grandchildren, Katelyn, Ashlyn, Dakotah and Cheyenne; a brother, LeRoy “Butch” (Mary) Naber of Waterloo; three nephews, Ryan, Travis and Christopher Naber and families along with many other nieces and nephews. She was preceded in death by her parents; grandparents; a niece and many aunts and uncles. Services will be 10:30 am Monday, April 8 at Hagarty-Waychoff-Grarup Funeral Service on South Street with burial in Garden of Memories Cemetery. Public visitation will be from 4-7 pm Sunday, April 7 at the funeral home on South Street, continuing for one hour before services on Monday. Memorials: In lieu of flowers, memorials may be directed to the family for a memorial to be established at a later date. Sherrie enjoyed all types of fishing, along with her place at the river, but mostly she enjoyed her family. To send flowers or a remembrance gift to the family of Sherrie L. Spore, please visit our Tribute Store. "Email Address" would like to share the life celebration of Sherrie L. Spore. Click on the "link" to go to share a favorite memory or leave a condolence message for the family.